Our mouth is constantly at work; it has to chew on food and produce saliva to keep our mouth moist and also to help our teeth from getting worse. Our sugary lifestyle and constant junk food do take a toll on our tooth as we see the recent increase in teeth problems. Debris is accumulated in between our tooth, and they often cause the build-up of tartar and plaque. Tartar is also accumulated due to the constant mineral deposits from saliva secretion. It can be painful, and it isn’t possible for people to visit a dentist regularly. So, some home remedies have to be there which can fight the bad things happening in our mouth. Using Fluoride based toothpaste is the best way to prevent tartar and plaque build-up. It is important to know the right way to brush your teeth and to do it twice a day to keep your teeth free from bacteria and food accumulation. Oil Pulling is also a great method to keep your teeth healthy. In this process, you have to take 2 tbsp. of virgin coconut oil in your mouth and swish it around your mouth for 15-20 minutes and then spit it out. Then you can brush your teeth as usual. Use of coconut oil has been seen to reduce teeth problems and also keep the gum healthy and young. Baking soda is a great addition to the pantry too as it is great for a tooth. You brush with baking soda 2/3 times a week to keep your teeth white and healthy. Or a paste can be applied every week to make the teeth free from build-ups and also to whiten it. The paste can be made with 2 tbsp. baking soda and 1 tbsp. salt. 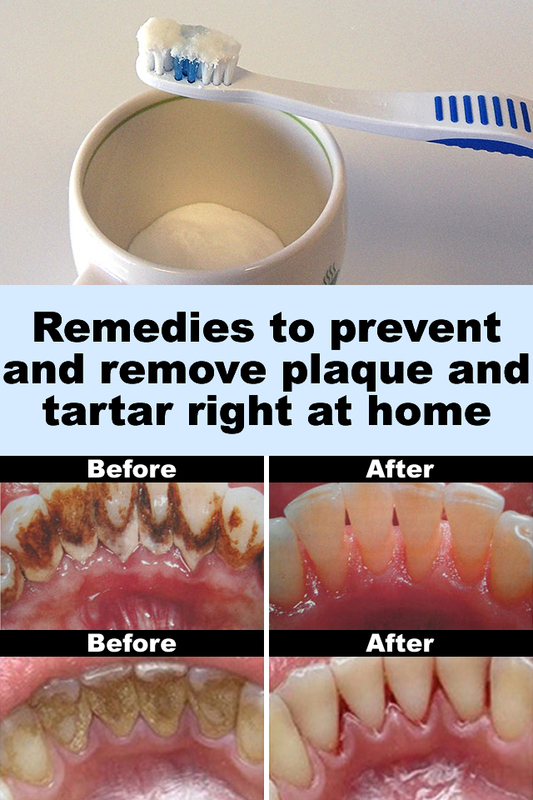 Baking soda with hydrogen peroxide can also be used to defend against plaque. Orange peel is a great way to get rid of tooth problems, orange peel can be directly massaged on the tooth for 2-3 minutes, or the orange peel extracts can be applied on teeth for once or twice a week. Cloves are great for teeth too, the oil found in cloves help in healing gums. A paste of cloves can be applied for 2-3 minutes and then rinsed off. Clove has anti-inflammatory property in it which provides relief from the discomfort of plaque and tartar. White Vinegar can also be used to prevent tartar as the acetic acid helps in preventing the accumulation of mineral on teeth. A tbsp. of white vinegar can be added to lukewarm water and salt, and one can swish it in their mouth for 2-3 minutes once a day to get the best results. Eating fruits regularly is also important for dental hygiene. Try to include fresher apple and guava into your diet. These tips will definitely help one prevent tartar and plaque and the discomfort that arises from them. The steps have to be followed thoroughly to get the best results. If problems persist, it is advisable to see a dentist.